Located on 355 acres of wooded foothills overlooking the Monterey Bay, Mount Madonna School is committed to an education that emphasizes academic excellence, positive character development and creative-self-expression. The vibrant program supports students to become caring, self-aware, discerning individuals able to live their passions in service to the world. Our students and faculty develop meaningful long-term relationships that inspire in-depth inquiry and foster a love of learning, self-discipline and perseverance. At Mount Madonna School, students are not only creative and inspired scholars, they are also athletes, artists, mentors and buddies – and most importantly, friends. Step into any classroom and discover students engaged and passionate about learning. Although well-known for our high academic standards, Mount Madonna is much more. It’s comprised of opportunities for travel, including regional, national and international learning journeys, clubs, leadership and service. We are located in the Santa Cruz Mountains halfway between Watsonville and Gilroy, and we are hosted by Mount Madonna Center, a community founded on the principles of yoga and dedicated to non-harming, self-development and service to society. The values of the Center and the beauty of the natural environment provide a supportive and inspirational context in which our learning community thrives. Mount Madonna School participates in Print Releaf. 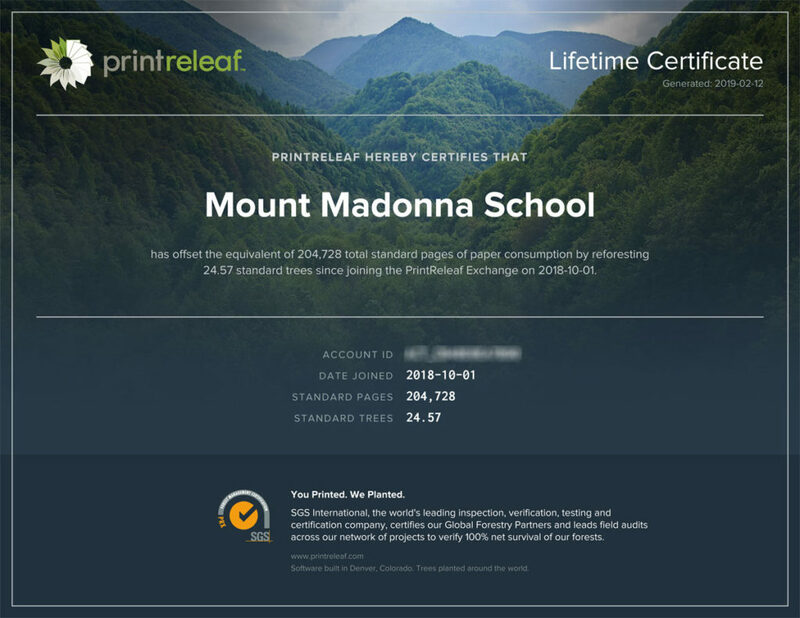 PrintReleaf calculates the forest impact of your paper consumption and your paper footprint is automatically reforested at planting sites of your choice.